The celebrated Cassini spaceship, that fatally descended into Saturn's clouds has now offered a prize for scientists, the knowledge of the icy plumes contain complex organic compounds - the essential building blocks of living beings. A Cassini image of Enceladus Saturn's ice-covered moon. Last fall, as NASA's celebrated Cassini spacecraft spiraled toward its final, fatal descent into Saturn's clouds, astrochemist Morgan Cable couldn't help but shed a tear for the school-bus-size orbiter, which became a victim of its own success. 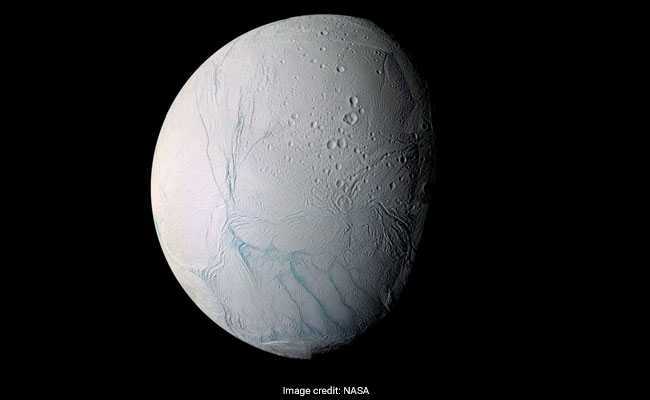 Early in its mission, while flying past Saturn's ice-covered moon Enceladus, Cassini discovered jets of ice and saltwater gushing from cracks in the south pole - a sign that the body contained a subsurface ocean that could harbor life. When the orbiter began to run low on fuel, it smashed itself into Saturn rather than risk a wayward plunge that would contaminate the potentially habitable world. Now, from beyond the grave, the spacecraft has offered yet another prize for scientists. New analysis of Cassini data suggests that those icy plumes shooting into space contain complex organic compounds - the essential building blocks of living beings. The fact that an aging orbiter not designed for life detection was able to sense these molecules - which are among the largest and most complex organics found in the solar system - makes the icy moon an even more tantalizing target in the search for extraterrestrial life, said Cable, a research scientist at the Jet Propulsion Laboratory who was not involved in the new research. A dramatic plume sprays water ice and vapor from the south polar region of Saturn's moon Enceladus. "This is a powerful study with a powerful result," she said. The findings published Wednesday in the journal Nature rely on data collected by two Cassini instruments - the Cosmic Dust Analyzer and the Ion and Neutral Mass Spectrometer - as the spacecraft flew through Saturn's outermost ring and the plumes of Enceladus (pronounced "en-SELL-a-dus"). Previous research using these instruments has detected small organic molecules such as methane, which consists of four hydrogen atoms attached to a single carbon. The INMS has also detected molecular hydrogen - a chemical characteristic of hydrothermal activity that provides important fuel for microbes living around seafloor vents on Earth. The molecules reported in the new Nature paper are "orders of magnitude" larger than anything that's been seen before, according to lead author Frank Postberg, a planetary scientist at the University of Heidelberg in Germany. There were stable carbon ring structures known as aromatics as well as chains of carbon atoms linked to hydrogen, oxygen, maybe even nitrogen. Some of the molecules sensed by the CDA were so large that the instrument couldn't analyze them. This suggests that the organics Cassini found are only fragments of even bigger compounds, Postberg said. There may well be huge polymers - many-segmented molecules such as those that make up DNA and proteins - still waiting to be discovered. "We astrobiologists get excited about larger molecules and that sort of thing because it means that something is building upon itself and making itself more complex," said Kate Craft, a planetary scientist at Johns Hopkins University Applied Physics Laboratory who was not involved in the research. The molecules Cassini has detected may be produced abiotically - without the involvement of life. But they are also the kinds of compounds that microbes on Earth like to eat, and they might even be byproducts of microbial metabolisms. "Put it this way, if they did all these tests and didn't see these larger molecules, [Enceladus] wouldn't seem to be habitable," Craft said. "But these findings . . . are reason to say, 'Hey, we need to go back there and take a lot more data.' "
Scientists believe that the gravitational influence of Saturn squeezes and flexes the porous, rocky material at Enceladus's core, generating heat. That heat allows for chemical interactions between the salty ocean and the seafloor. On Earth, such water-rock interactions provide fuel for chemotrophs - organisms that obtain energy by breaking down chemicals in their environments - and support vast ecosystems in the ocean's deepest, darkest depths. Postberg and his colleagues propose that the organic molecules generated in Enceladus's ocean's depths eventually float to the surface, where they form a thin film just beneath the planet's icy crust. Earth's oceans are capped by a similar film, they note - a millimeter-thick blanket of tiny microbes and organic matter that serves as an important interface between sea and sky. Research shows that this layer helps drive weather; as bubbles burst from breaking waves, particles from the film are lifted into the air, where they provide a nucleus around which water can condense to form clouds and fog. 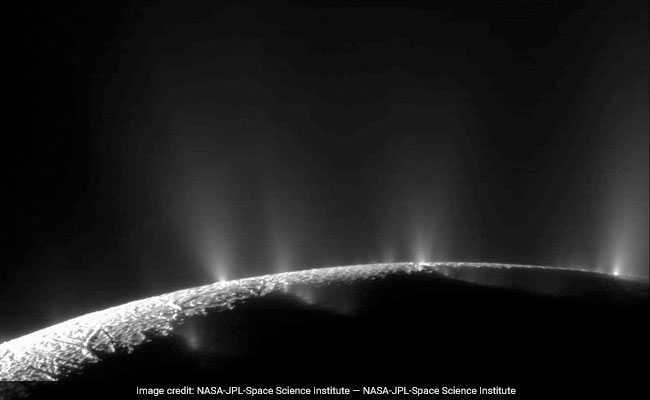 A similar process on the surface of Enceladus's ocean may form ice crystals with organics at their core, Postberg said. These grains are then sucked upward through cracks in the moon's crust called "tiger stripes" and then flung into the vacuum of space. Enceladus's plumes are extremely tenuous - more like a thin veil than a jet from a fire hose - and scientists have questioned whether a spacecraft flying through the spray would be able to collect enough organics to draw conclusions about their origin. This result, Postberg said, shows that Enceladus "is kind to us and delivers its organic inventory in high concentrations into space." Cable is deputy project scientist for a concept called Enceladus Life Finder, which would use more advanced instruments than the ones on Cassini to sample the plume during a series of flybys. The mission has not been funded by NASA, and the space agency has no projects in development to return to Enceladus. She, Postberg and Craft expressed hope that this latest finding would generate interest in a new mission to the icy moon. "Enceladus is screaming at us that it has all the ingredients for life as we know it: water, chemistry, organics," Cable said. "We have to go back."